Religious people are often chided for believing in "fairy tales". No such derision is attached to die-hard Obama supporters who believe everything will begin to right itself in America, once the Illinois Senator is elected as US President. After designating him "Le Candidat Global" in an earlier issue, this weekend Le Monde published the deafening stats of Europeans who favour him over his rival. 82% of Germans. 84% of the French. 74% of the British. 72% of Spaniards. 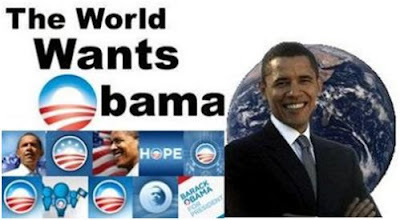 The world wants Barack Obama as US President. Why is there such an obvious disparity in viewpoints, between what foreigners want, and what the polling numbers show Americans want (i.e., that Obama has had a very mild upsurge in support, after Senator Clinton "suspended" her campaign)? What is it that they are seeing, or they believe they see in him, that the US public doesn't to that extent? Is it race? Is it ideology? Or is it something else --something metaphysical? Let's examine the first attempt at an answer. In 2005, when Pope John Paul II died, people all over the world decided they wanted a non-white Cardinal to be elected Pope. Do you recall that? Everyone was hedging bets it would be Cardinal Maradiaga of Honduras, or even better, Cardinal Francis Arinze of Nigeria. 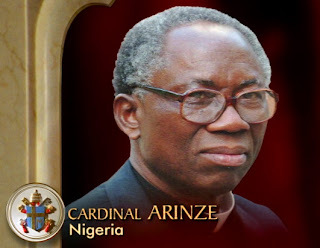 The ironic part of this (apart from the fact that those people included a lot of non-Catholics or non-practising Catholics, and therefore had no stake in the outcome) is that they were overwhelmingly of liberal world view...and yet they were choosing Cardinal Arinze as their go-to-guy simply because he was an "other". He was black. Never mind that he was almost as conservative (some say more conservative) as the hated front-runner, "God's Rottweiler"/"The Panzer Cardinal", Joseph Ratzinger. What mattered is that Francis Arinze was not white. To paraphrase the Clintonian slogan, it was...the statement, stupid. So race is no doubt a reason why the world wants to have Obama be "their" President. He's the "other" in this election too. But what of ideology? Is the world more comfortable with a Democrat than a Republican in the White House, even a "maverick" RINO like Senator John McCain? During the past few years, Europeans have ousted leaders who were anti-American, and put pro-Americans in their place. The Big Euro Three still includes Labour ally British PM Gordon Brown, but it now welcomes Nicolas Sarkozy of France, and before him, Dr. Angela Merkel of Germany. Even if Gordon Brown is defeated by David Cameron, surely a Tory premier wouldn't hit a sour note on this chorus of approval. Americans reading this blogpost, then, might be forgiven if they think the most important European players are now Right-Wing, and therefore, so must the public who elected them be. The overwhelming world view of continental Europeans is still endemically pro-Leftist. No matter who is in power, the EU countries will always favour more socialist policies than the US will, not only because of their post-feudal traditions -- but also because they believe that is the fairest system around. That is, some do, a lot do in fact, but most don't. They believe nationalised health care, and government handouts weaken any economy, and makes the State act as parent-surrogate. Neither sentiment jibes with American notions of individuality, and deep-rooted antagonism to federalism. So whilst the Old World may be turning to the Right, Europeans are firmly committed to the Left's view of the world. And what are the 3 most important factors in Leftist ideology? It's not difficult to see which candidate of the two running for President, most aligns himself with the first ideology. What, though, if it's deeper than ideology? What if it's to do with perceptions of how a President Obama would handle the world's only remaining super-power, at its very height of power? In other words, what if it's metaphysical, rather than the grubbier reasons of race and ideology? To answer that, one must pose the question: what does the world want from an US President? Let's provide some random answers. Despite the obvious tongue-in-cheek, these are not answers so much as metaphysical demands. The world demands that Americans be less aggressive; be more concerned with the rest of the world; in short, rethink, reshape and reform themselves, both systemically, but also personally. My God, it's a total INJUSTICE that the world can't vote for the US President. For ill - or for good - it's out of our hands: both are Americans and nothing can be done about it. We start from the fact that if you're not American, you don't have the right to vote and to choose between the two in November. This is a great injustice because the 44th president of the United States will decide things that could affect foreigners more than his own compatriots. America would be so different if only the world could vote. Well, the next closest thing to being able to vote, is at least to choose a candidate which is most likely to change America into one's ideal America. That's what foreigners see in Senator Obama. The signals he sends are just as blaring as his international poll numbers. And if they don't hear it from his own lips, they are culling information from those who might serve in an Obama administration. On Tuesday, Richard Danzig (the most likely choice for National Security Adviser according to observers) made it perfectly plain that President Obama's geopolitics will be nothing short of bearable. Mr. Danzig also referenced Luke Skywalker, but I confess, even I have my limits about quoting this geopolitical theatre of the absurd. General De Gaulle once dismissed Brazil with these few words: "Brazil is not a serious country". And I'm here to tell you that Senator Barack Obama is not a serious candidate. Not for the US Presidency, he's not. It doesn't matter if the world wants him, academia want him, media want him, even his Kenyan grannie wants him. Americans don't elect Presidential candidates whose associations are anti-American, and whose pronouncements are not tough, and realistic. They just don't. On the rare occasions when they have, their administrations ended as utter failures and that's why there have only been 3 Democrats elected to second terms in all of the 20th century. Only FDR's can have been considered a success -- and he waged war, okaying the nuclear bomb, ushering in the American Century. 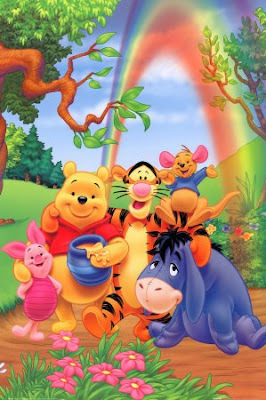 However, if they do this November, and this Winnie the Pooh fairy tale strategy is put into place, America will be weakened structurally beyond belief. Maybe now we have the real reason why the world wants Obama. They want a weaker America; which ever candidate comes closest to delivering that wish, they will be in his or her favour. Well, apparently Obama can deliver that wish, down to the pots of hunny, hugs, and multi-coloured rainbows. ...sorry World. America is a serious country. Now close your eyes and if you're good children, we'll read you another fairy tale in 4 years. Promise. Hey, World. How'd the last vote turn out for ya? IN THE COMMENTS: Ruth Anne Adams writes she actually took Holy Communion from Cardinal Arinze's hands! Moreover, in 2005, you can see she was hugely in the Arinze-for-Pope camp, in this well-written blogpost. Alcibiades goes one further and says that Thailand is a major US trading partner, and McCain represents pro-free market trade than Obama does. JSU definitively says: "I bet Iraq would pick McCain in a landslide, though." Heh. True. But think about why that is true. Madcynic interjects with the lone European voice in the comments: "The current administration did a very good job of making an enemy out of large parts of the European populace though. Noone wants that to continue and people believe Obama to be the better choice to prevent further enmities and misunderstandings...". Though his viewpoint, I think most of us can agree that's true. And thanks to AmeriDan, as ever! Is it wrong of me to insinuate that Europeans may believe that a weaker America implies a stronger Europe? Isn't that really false? What do you think Vic, I'm very curious. Hey, Ron! Thanks for the comment. Due to my heavier than usual schedule, I've been AWOL online. Just to say that the enveloping rhetoric one can speak in a blogpost to make a point, is not really conclusive, as you know. I'm limited to my perceptions of enormously difficult to fathom ideas, like "Europe" (which as a Brit, doesn't include my country in my mind, BTW). Having said that, with all my caveats in place, my sense is that "Europe" doesn't want to be America's enemy. But not at all. That's not its raison d'être or its ethos (in the sense that Europe is an idea, more than an actual place). They have a tunnel, linear vision of where Europe should be headed (towards a more enlightened, tolerant, and above all, peaceful place) and anything which interrupts that visual of things to come is mordantly retrograde. I think their frustration with America has overwhelmingly to do with this rude door-stop that America represents to them. But I don't think the EU or Europeans are in the least interested in being active enemies or that a weakened America will forecast a stronger Europe. They are quite convinced that a strong Europe can be made on its own, without the Yanks' help (that's why cold showers like Maastricht and the Irish rejection of the Lisbon Treaty are so disheartening to those who think that). This itself is a dreamland of fairy tales. Europe is Europe because America protects them. They don't have to wage war anymore. We guarantee their peace. As for the palliative reason you mentioned, yes I fear that too. I also feared, back when I thought it was Hillary Clinton as front-runner, that America would seem weaker with a female at the helm (not for Europeans, but for our misogynist enemies). What I wouldn't give today, to have Mrs. Clinton as the Presidential nominee instead of Obama. I mean, all reasons to loathe her aside, and boy there are many aren't there? ...she still would protect America more than Obama intends to, given the Winnie The Pooh allusion. My jaw is still hanging open, my dear Ron. Someone wake me up from this nightmare. BTW, Ron, to your point about Jimmy Carter. Which Democrat President was the only one not to go to war in the 20th century? Wilson, FDR, Truman, JFK, LBJ, Carter, Clinton? In the "If the World Could Vote" link, in the update, a surprising country leapt ahead of the rest -- for Senator McCain. ...97.4% of Thais who voted online there are ferociously pro-Geezer. Whoa. Would a reader care to explain? JSU? Please don't say racism!! They're minorities. /is a sarc tag necessary? Perhaps McCain is the only candidate with any experience of Southeast Asia? Ahem. Yes, I suppose Carter's hostage raid on Iran run by Larry, Moe, Curly, Groucho, Harpo, Chico, Gummo, Zeppo, and Oh-My-God-Did-We-Screw-That-Up-o can't really count can it? Crack open the Billy Beer, just to drown our sorrows...if beer could only age like scotch! Your remarks about defense also apply to Japan and South Korea as well? Yes, it would seem so! It's kind of hard to leave an insightfull comment when you cover every single base of an issue. WOW, what an awesome post. You make me more at a loss for words than Obama without his tele-promter. McCain support(s)/(ed) a Free Trade Agreement with Thailand. That could be certain business interests voting. But, then there was a coup... Wikipedia can probably explain it better than me. According to the poll, Venezuela loves John McCain. I wish they gave a better breakdown of how many people voted from each country/IP range. Vic, I know nothing of Thailand, except that that's where Tiger is from. Americans have responsibility. Our elected leaders actually have to deal with being the guarantuor of peace and stability for a world that takes these things for granted. Foreigners don't. Their preferences don't (for better and for worse) mean that much. This both allows and encourages them to vent their resentment when these sorts of polls come around. I bet Iraq would pick McCain in a landslide, though. I received Communion from Cardinal Arinze once. I think there's an issue you overlook, and that is party affiliation. In Europe and in many parts of the world, candidates are the spearheads of their party, but they are also a slave of their party in terms of programs. While in the US party affiliation plays a certain role, in the end, the presidential election is not an election of party, but of person (as you continually point out). I have the sneaking suspicion that what people in the rest of the world want is the ABB. Anything but Bush, and that tends to include his Republican colleagues. Even though McCain is clearly different in terms of experience and attitudes compared to the current President, he still remains a member of the same party, and I believe that to be much of the reason why so many in the world would prefer Obama. That and his rather energetic youthfulness. Good point, Ron. I mean, maybe it's a stretch, but there must be something in the Thai reading of McCain that respects the treatment he underwent next door. If there were a prize "For miserable attempts at protecting your own people" Award, Carter would've been given it in perpetuity. For me, at least, no it doesn't count, alas, Ron. Oh God, yes Billy Beer! BTW, to mention a good word about President Carter, the scene in Demme's "Man From Plains" documentary where he's talking about his mother, Lillian, really brought a tear to my eyes. That doesn't make him any the less laughable and ineffectual though. South Korea is another ball of wax, since their youth is BITTERLY anti-American there. But Japan is much more deferential towards America these days. Thanks so much for your kind words. If the post gave you any kind of satisfaction, that's all the feedback I need. I'm sticking to a post once every 3 days, at least! The United States is Thailand's second largest trading partner after Japan; in 2006 merchandise imports from Thailand totaled $22.5 billion, and merchandise exports totaled $8.2 billion. I had no idea our relationship with them was so interdependent! JSU: "I bet Iraq would pick McCain in a landslide, though." Heh! I will update the comments with that. Basically, you are saying Europeans are more ideologically-driven, than personality-driven as Americans are. Of course, agreed. I made that point myself in the post, as you noted below. While in the US party affiliation plays a certain role, in the end, the presidential election is not an election of party, but of person (as you continually point out). My point is a little broader than that. I think it's true that Americans go for the personality, or to put it in a more mature way -- the world view the candidate projects. In America, until the 1970s, there was not much to differentiate between Democrat and Republican. Some say that is still the case, but I think most Americans would disagree with that now, in 2008. Clearly, the Democratic side of the Party Obama represents is more extreme-Leftist, or at the very least, is comfortable with its proponents. Certainly his recent blog problems, when it tolerated hate speech from its posters, shows you that. So in Senator Obama's case, it's not just the person. That's gravy. The main meal is his ideology. That's what Europeans and now certain Democrat Americans especially like. I have the sneaking suspicion that what people in the rest of the world want is the ABB. Anything but Bush, and that tends to include his Republican colleagues. Even though McCain is clearly different in terms of experience and attitudes compared to the current President, he still remains a member of the same party, and I believe that to be much of the reason why so many in the world would prefer Obama. That and his rather energetic youthfulness. I think this kind of rationale some people employ is specious at best, and intellectually dishonest, at worst. The truth is America has never been Europe's cup of tea. Not since 1918, at least. Even then they didn't like Americans in the form of President Wilson stentoriously berating them like children for not playing nice with each other. They didn't like his "self-determination of peoples" when his own country was rent asunder with institutionalised racism and separatism. And even then, they didn't like the more conservative overall politics America represented. It might have been liberal, but it sure as heck wasn't socialist. Furthermore, this "ABB" idea is similar to the mindset of many Europeans towards ANY US President. We might be too young to remember, but the world hated LBJ, it hated Nixon, it didn't like Ford, it didn't take Carter seriously, it hated Reagan, it pilloried Bush Sr, and only tolerated Clinton, who was the most popular of the lot. This is only because Clinton was a bit of a bad boy, thus didn't stand for the moralistic, religious America that Europe so reviles. That he never invaded a country without first consulting the oracles at the UN (meaning he was in favour of multilateralism, and look where that got us to in 2001), made him less warmongering than the rest. Again, I say, it's not difficult to figure out the Leftist-prone mindset of even the most conservative European today. The closer you fit, the more support you will get. You know what, Malte? If Bush had crawled on his hands and knees and begged many Europeans to like him, they wouldn't. He knows that. You all know that. I know that. The man was condemned from word-go. When that happens, you don't go grovelling asking to be liked. A great nation at the height of its powers doesn't have to act like a defunct European empire or a defeated one in WWII. If it does, it has no business being a superpower. That Bush is a poke in the eye to the world is actually one of the considerations so many people voted for him. I say to the world, if you want to understand America, you'd better do a better job of it because it's not just an one-way street. Victoria: There's dust on the pixels, but here 'tis. I'm not convinced Bush was damned from the start. At the beginning he was ridiculed, yes. But going into Afghanistan without much of plan and then going into Iraq without UN support...along the route rhetorically declaring certain countries in Europe dangerously close to the axis of evil...that most certainly didn't endear him (and his administration, of course Bush didn't smash all the porcelain by himself, he had competent help) to Europeans. If America wants to act like a superpower, it should look at when it was not the only one and maybe do a reality check on how differently it acted in the Cold War compared to now. If the US wants to continue to police the world without respecting its allies' opinions, fine. But then don't come crawling and asking for more European involvement when things don't work out as...dare I say planned? As for your Europeans not liking Americans since 1918. I tend to disagree. But as you point out, preaching about morality without first cleaning up your own mess, is likely to anger a lot of people. And yes, that does go both ways. I'm not saying the world has a right to vote in the US presidential elections - but it certainly is entitled to an opinion. And I sincerely believe that when you come up with "Europe hasn't liked America since 1918" you're making it a bit easy for yourself - because that way, Europe looks like an irrational angry child who just won't play along. But the time when Europe and NATO would just play along, rarely sincerely questioning America's decisions, this time is over. It's a new world out there. And if America is not ready to understand that allies need respect, it will eventually stand alone. And that doesn't go down very well. P.S. I'm not quite sure which 2001 event you mean in the multilateralism point. And yet another post script: As always, this is about politics, nothing personal and no offense meant. 'm not convinced Bush was damned from the start. Malte, you have to look no further than our own soccer board, a tiny little space in the world wide sphere, to know what you say is not true. Bush isn't the kind of politician, and dare I say, the kind of person that is liked by most Europeans. We don't have to be politically correct, you and I. You know I'm not a journalist who has to be neutral, and I know you're my friend which nothing you will ever say (short of derangement or disrespect, which you have never shown! ;) will ever change that. If we can just be honest that Bush was never liked for the get-go, I'd be willing to listen to the other points expressed not just by you, but by so many others. The will to like, to understand, and ultimately, to back up the US with Bush and most Republican Presidents, is simply not there on the part of Europeans. But particularly Bush Jr. When I was growing up, Reagan was hated. The anti-nuke protest crowds of our youth are a living testament to that. They played a huge role in dismissing him as a buffoon-cowboy. What I'm trying to say is, once you dismiss someone, don't be surprised if they surprise you later. Let me try to soften my words though, as I too, do not hold any grudges! I have to make that clear too. Though it is a stretch to say that the Soviet Union was brought to its knees by the Reagan Administration (even including Thatcher, Kohl, Pope John Paul II and the other conservatives of the era), they didn't help. Those of Leftist viewpoint know the dangers of allowing a tough stance against leftist policies. Hence their distaste when a president like Bush channels that kind of rhetoric. They hate him, of course. But moreover, they fear that his policies will be effective. Let me say that Europe needs the US a lot more than the other way around. For us, we need you as international and diplomatic partners. For you, you need us to guarantee your safety. It's difference between pie in the sky, and sleeping well at night. P.S. : I'm going to go on record about something, regarding an European country. I've never in my life been to a protest march. I hate them. I have always adored France, love speaking French, reading Foucault, Bourdieu, Revel and consider myself an ardent Francophile. I swear to you I will be the first one in a protest march opposite the UN. There are some people who do not deserve the lives of Americans. The US paid Lafayette back in WWI. Since then, the French have been nothing but ingrates. Their attitude towards Americans disgusts me. If they're ever in the same position as in WWII, let them reap their consequences. I could not care less what the World wants in a US President. As the rest of the world caves in to Islamist invaders' demands, why should this country countenance such suicide? Our ancestors came here to escape the Old World's stupidity, as did the Asians and post-slavery Africans. Why, if you fled a corrupt, elitist miasma would you wish such ugliness on your new country? And why would we now accept such inanity for the USA? Screw the world. Let them create free societies, then they can talk to us. Not before! The Global Election - vote in all country´s elections. The results are broken down to what each country´s citizens thinks. www.iftheworldcouldvote.com was a very nice idea for a site and let us all vote in the US Elections. If you enjoyed seeing what people around the world thought you may also find http://www.whattheworldbelieves.com interesting.